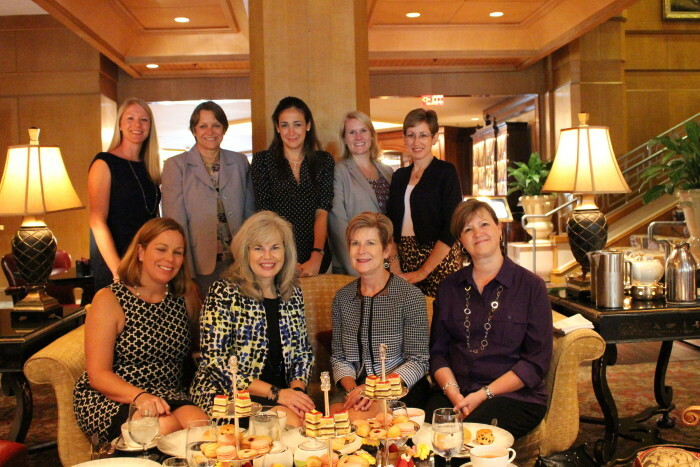 August 6, 2015 – I had the great fortune to have afternoon Tea at the Ritz with a lovely group of ladies. I selfishly persuaded them to go but I think we all enjoyed our brief escape into luxury. 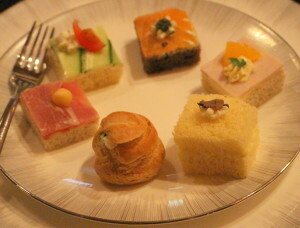 Everything about afternoon tea at the Ritz is spot on. We walked into the oak paneled lobby and were seated around this large coffee table. Why was I impressed with this table set up? 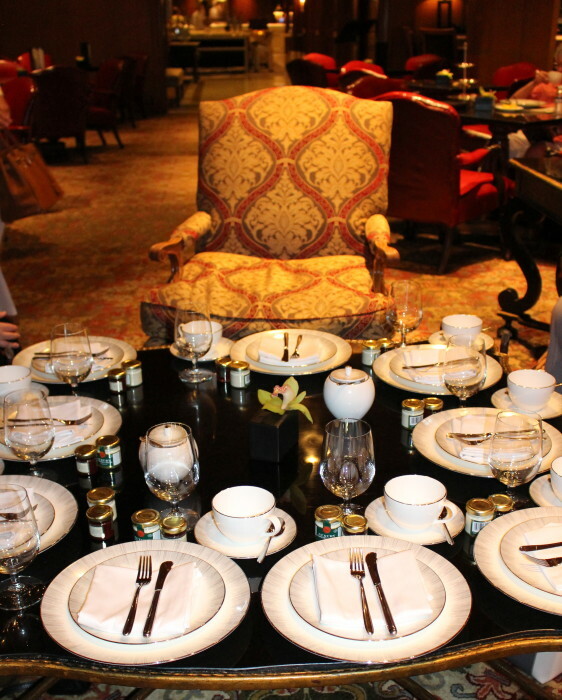 Afternoon tea is sometimes called low tea because it is properly served on a low table. The atmosphere was unhurried and we went in and closed the door on the outside world. 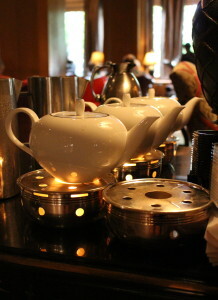 The table setting of classic white china trimmed in silver and silver brush strokes was striking against the dark wood. The orchid was an understated, elegant centerpiece. 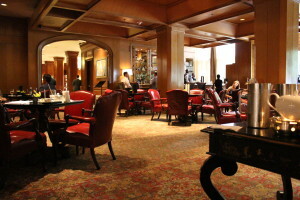 The lobby exudes comfort and elegance. A nice place to linger. We were served tea right away. 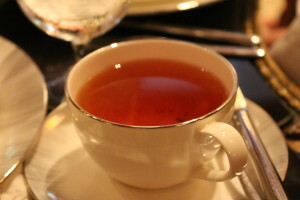 Our choices were Earl Grey Organic, Orange Jasmine, and a tisane called Wild Blossoms and Berries. 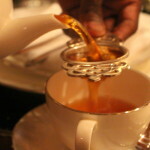 Damon, our courteous waiter, poured the loose leaf tea through silver tea strainers. We kept him busy pouring for all nine of us! He was kind enough to tell me they use teas from Mighty Leaf teas. Mighty Leaf is a good commercial tea company focused on organic whole leaf teas. I had the Orange Jasmine – a bold black tea with a very delicate floral scent and a minor hint of citrus and somehow had a slight chocolate flavor. I had cup after cup after cup. Next came the food. Oh, the food! 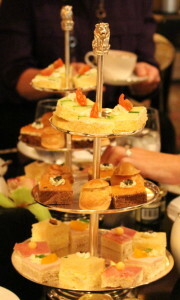 The first course was the savories served on silver three tiered stands. 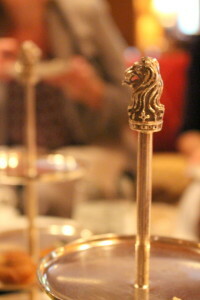 All the stands were topped with a lion’s head on a crown which is the logo for the Ritz Carlton. Georgia shrimp profiterole with tarragon and basil – one small bite of fine southern cuisine – my favorite! Then we had our scones course with two scones: one plain and the other black currant. The crusty scones were served with devonshire cream and strawberry preserves. I’ve always said that scones are a good jam delivery system. They did their job exceedingly well! 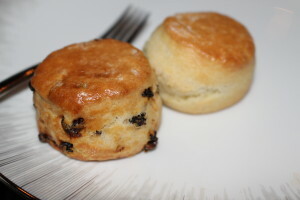 Note that they are shaped in the traditional English rounds versus American scones which are commonly cut in triangles. 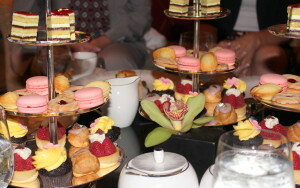 On the heels of the scones, dessert was served. Just beautiful. 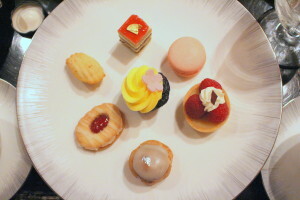 I just had to taste each one but I was so stuffed! If you go, go hungry. Pistachio opera cake topped with edible gold – opera cake is a many thin-layered French almond sponge cake. It was the most beautiful of the desserts but it’s more pretty than tasty, if you ask me. Strawberry French Macaron (not to be confused with a Macaroon) was light and airy. It just melted in your mouth. Lemon Raspberry Tart – this was the best one. The custard had a smooth buttery feel and the raspberries were huge. Chocolate Lavender Profiterol topped with edible silver – another favorite. The filling was really creamy like a light pudding. Berry Citrus Shortbread Cookie – goes down good with tea. Lemon Madelin – very good and had an almost cornbread texture. Chocolate cupcake with buttercream frosting in the middle of the plate. Pretty but basically a regular cupcake. This wasn’t a frou-frou little girl’s tea. 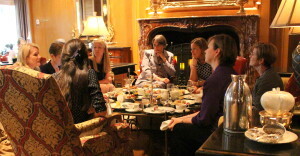 This was a sophisticated professional event conducive to business planning and insightful conversations. At the end we enjoyed a glass of champagne and a toast. This gathering of friends doesn’t get a chance to get together but once in a blue moon since we travel from far and wide so it was a very special time and I’m glad we got to spend it over tea. Kitty, Awesome site. It has been awhile since I last visited. Love the Ritz piece. Can’t wait for our next adventure. Thanks Dana! I’m glad you enjoyed it. 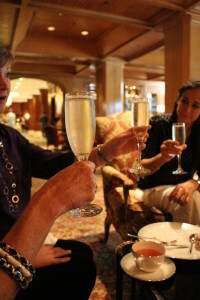 The Ritz has a lovely atmosphere.